I have been using the vSphere Web Client more and more lately and though transitioning away from the familiar legacy vSphere C# Client is not the easiest thing to do or always possible for every single operation, there are definitely some nice benefits when using the vSphere Web Client. With the upcoming vSphere 5.5 release, there is even more cool new features in the vSphere Web Client! Here are my top 5 favorite enhancements in the new vSphere Web Client 5.5 in no particular order. For a complete list of new features in the vSphere Web Client, I recommend you take a look at the What's New in vSphere 5.5 whitepaper. 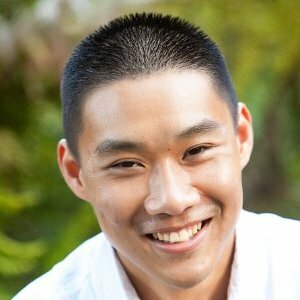 Being a web application, the vSphere Web Client has always worked on a Mac OS X system, however you may have noticed a couple of things did not work such as OVA/OVF upload, remote device management such as mounting an ISO/Floppy and the biggest one of all is virtual machine console access! This has been one of the most requested feature that I can think of and I am personally excited to see this finally come to fruition. In addition to to the native VM console support (HTML5/WebSockets), there is also now a vSphere Client Integration package for Mac OS X that provides both OVA/OVF upload and remote device management support. This alone is enough for me to upgrade my vCenter Server to 5.5 to get these new feature! The recently visited objects is a pretty handy feature that came in vSphere 5.1 which allows you to see what objects you have been recently working with. However, this feature may not have been very well known due to its tiny icon. I am glad to see this feature get its own icon and is now located at the top of the vSphere Inventory Navigator between the navigator and pin icon. 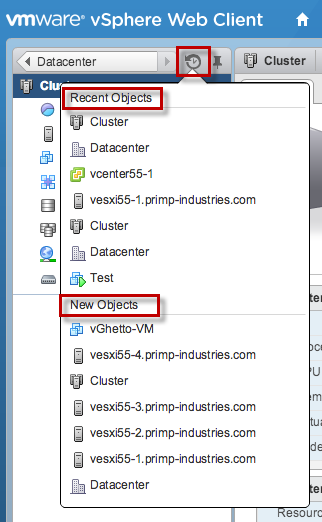 In addition to this change, it also now includes a list of the recently created vSphere objects which can come in handy when you are doing something new for the first time and would like a quick way to view the sequence of objects created. I am pretty sure our vSphere UE engineers have a more elegant name for this awesome feature, but you can now view the history as you traverse through the vSphere Inventory Navigator and navigate both backwards as well as forward (which is new in vSphere 5.5). To view your current history, you simply just right click on the navigator bar at the top and you will get a drop down list of your history. You can go move forwards or backwards through your history which is a great if you are still getting familiar with the vSphere Web Client and forgot how you got to a particular object. 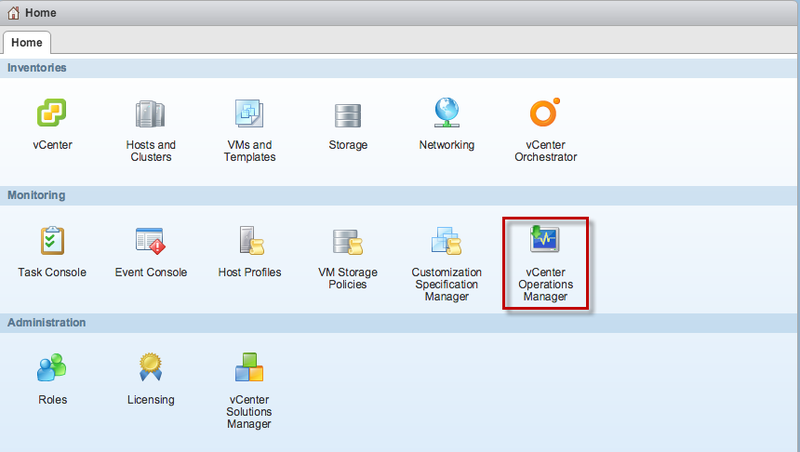 I thought this was a pretty cool enhancement by allowing you to deploy vCenter Operations Management from within the vSphere Web Client. 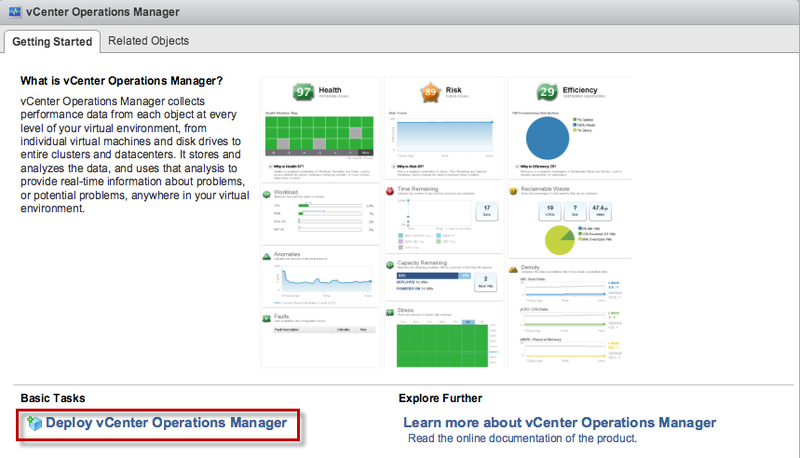 You will notice a new vC Ops icon on the main dashboard and on the Getting Started page, there is a link at the bottom that will allow you to deploy the vC Ops appliance by first logging into your MyVMware account. I wonder if we will are going to start doing this for other VMware solutions and just making it easier to deploy the latest version without having to first download it onto your local system. A common piece of feedback that I have heard regarding the vSphere Web Client experience is that it does not automatically refresh the screen. This is a change from the vSphere C# Client where it will automatically refresh the inventory, but of course there is some overhead associated with this refresh as it needs to pull the latest data from the vCenter Server. However, with the latest vSphere Web Client 5.5, you can now enable auto-refresh using an advanced configuration (by default it is disabled). Before you enable this, do note that this can alter the performance of your environment and be aware this will prevent the session from automatically logging out if you have configured an idle session timeout. Another feature that I found interesting that can also be controlled in this configuration file is the sliding animation shown when clicking on the vSphere Inventory Navigator. This I assume is to reduce the amount of resources loading the animation, unless the animation was bothering some folks? There are few other settings that you can control in the webclient.properties, you can take a look at the file for more details. There are definitely a few more new features in the vSphere Web Client 5.5 that I have not mention, but these were my my top five favorite enhancements. One more thing I would like to also mention is that vSphere Web Client in vSphere 5.5 release definitely feels much snappier than previous releases and this has made for a much better user experience in my opinion. 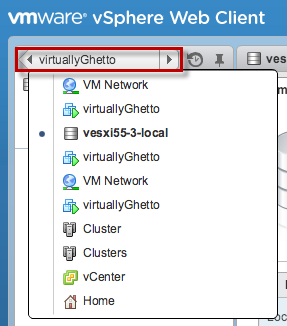 When you get your hands on the new vSphere Web Client, what will be your favorite new feature? One thing that is still dissapointing is that this is not available on esxi. I run esxi at home and have only macs. 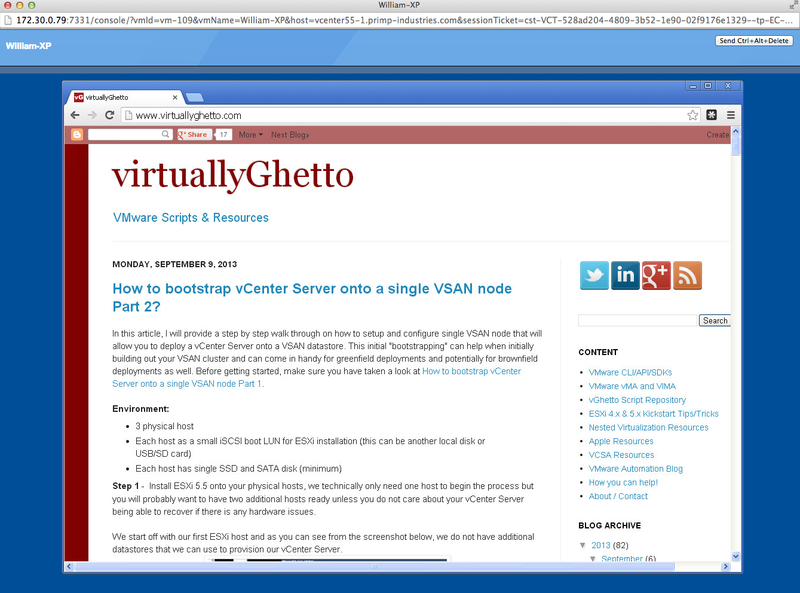 This means I need to have a windows VM on my mac to manage my esxi machine. I tried to find the config files for “Configure Auto-Refresh” on my windows installation, but no luck. Do you have any idea where it might be located? Hi, i use Macbook Pro with Yosemite (all updates installed) and VCSA (latest Build) – i can open Web Client, but remote Console doesn’t opened. Is there specific settings (on Client- or Serverside) required so that i can open it in Safari? There’s nothing special you need, it should just work automatically. Can you also try Chrome or FF to rule out Safari browser? I configured auto-refresh in vcsa 5.5 and i really love it. I hope i can re-enable it in vcsa 6.0. Cool! Thanks for replying. I’m big fan of your blog post.